DraftKings now offers a free entry to a fantasy contest on any sport of your choosing in which you can win real money for first time players. The person registering does not have to enter a promo code to be eligible for the free entry. If you would like to deposit as a first time entrant, you can enjoy DraftKings doubling your first deposit up to $600. The site also offers a bonus for referring a friend. All bonus cash can be used to participate in any of the sport contests offered at DraftKings and slowly unlocks for withdrawal as you continue entering real money competitions or tournaments. DraftKings also offers Frequent Player Points for those who enter paid contests. The points are awarded regardless of whether the player wins or loses. You can also earn Frequent Player Points by setting and achieving goals otherwise known as missions. The FPP can be used to as a freeroll to enter other contests. The FPP system is perfect for frequent players as well as those who refer friends, allowing them to increase their chances of winning by turning their points into entries for real money games. 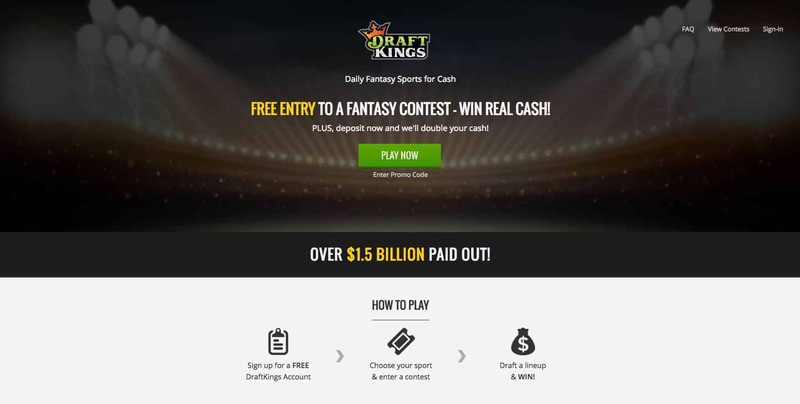 DraftKings offers plenty of distinct advantages when it comes to fantasy sports. The transparent manner in which the sports are run and the tech support provided ensures that DraftKings will remain a destination of choice for those who play daily fantasy sports. This makes room for a professional competitors, increasing the challenge and interest in the game. DraftKings fantasy sports is played on a daily basis, making it much easier for participants who are unsure about their time commitments over a season. The site offers more than $1 billion in prizes each year, making it the top place to play fantasy sports. DraftKings has the strongest hold on the NFL in the industry, with adds more even more games and tournaments available to players. Making up a team takes as little as two minutes. Players can choose to build teams for all of the major sports and now officially includes the eSports game League of Legends. 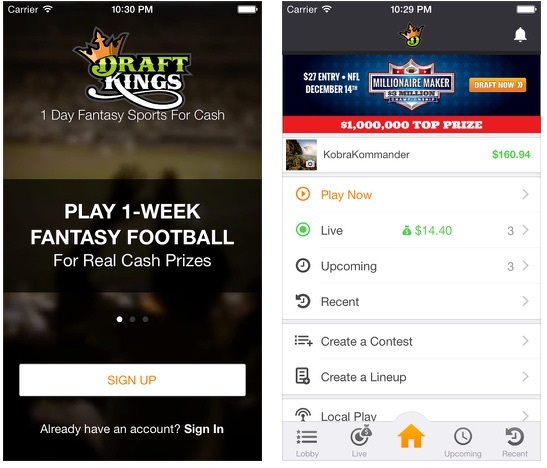 DraftKings has a mobile friendly version for both Android and iOS users. The free mobile apps have been through a series of updates for optimization, with some players even preferring the mobile apps. With these apps it is possible for members to easily join current games, tournaments, and prepare for upcoming competitions. Moreover, when playing with real money, the app will display all funds and winnings are shown in green. The iOS version has been reviewed to operate more smoothly than the Android version. Using the mobile apps, members can enjoy fantasy sports on the go, eliminating tedious waiting times. The website is well-designed and loads quickly. This makes it simple to build a team in minutes and start participating. The easy to navigate site is designed for intuitive navigation. This makes it simple for the user to make deposits or participate in the games. Contestants can choose to enter contests from the front page, making it easier to navigate. Choosing the sport, the level, the number of persons in the pool, the team, and everything else is outstanding on this site. Moreover, the site provides a cap on player salary, ensuring that every participant in the contest has an even chance of picking a winning team. DraftKings is 100% legal in the states who authorize the platform and winnings are paid out almost immediately. The company keeps the deposits segregated and does not use it for operational expenses, ensuring that players are assured of their winnings being paid quickly. While 43 states in the US permit online fantasy sports, the states of Washington, Iowa, Idaho, Montana, Hawaii, Arizona, Alabama, Nevada and Louisiana have banned these games and as such DraftKings does not permit those in these states to participate in the real money competitions. DraftKings is working at legalizing Daily Fantasy Sports in each and every state and continues to push evidence to clear the game as skill based. As part of the current legal requirements, DraftKings will notify the authorities if a player wins more than $600 in a single year, including bonus points and other payouts. As such those playing in the fantasy sports league and making money from the winnings should make sure that they declare winnings to the tax authorities. Players located within available states can participate in the fantasy sports competitions offered by DraftKings, being that they are of age. While most states require participants to be over the age of 18, some participants must be over the age of 19 or 21 such as when playing in Nebraska and Massachusetts, respectively. Members can make deposits using Visa, MasterCard, Discover or American Express credit cards or gift cards. You can also use PayPal to make a deposit..
DraftKings makes it as easy to withdraw money from a member’s account as it is to make a deposit. Players can simply fill the online application in the MyAccount section to withdraw funds. To eliminate fraud, the company off only two ways for you to make a withdrawal. You are able to either use PayPal or receive a check through the mail. Hassle free payouts and member security are assured by the site, and you can call support for help in making a withdrawal. DraftKings offers live customer support in the form of a chat window seven days a week during business hours. In addition, members can email customer support with their queries. Industry leading customer support and a helpful Frequently Asked Questions (FAQ) page gives DraftKings the best support in the Daily Fantasy Sports industry. GPP’s – The site offers multiple types of wagers such as guaranteed prize pools where the winner is assured of the prize even if the pool does not fill up, increasing the odds to win. One on One – In one on one contests where the winner takes all, you can now play against players of a similar experience level. League Competitions – Leagues are available so you can play against two or more opponents in a smaller field ranging 3 to 12. 50/50s – The lineups that finish in the top half of the field win an equal share to whatever the number of entries bring in. Satellites – These are qualifying rounds where participants can aim to win a free ticket to the higher rounds with much larger payouts. Step Tournaments– In steps, you will have to advance throughout the tournament step by step to reach a big payout. Multipliers – In these contests, winnings can quickly be multiplied based on odds and how many players you are going up against. Freeroll – Contests that are free to enter and are great for beginners. These contests that are aimed at ensuring the newer members are more comfortable before playing in real money competitions. 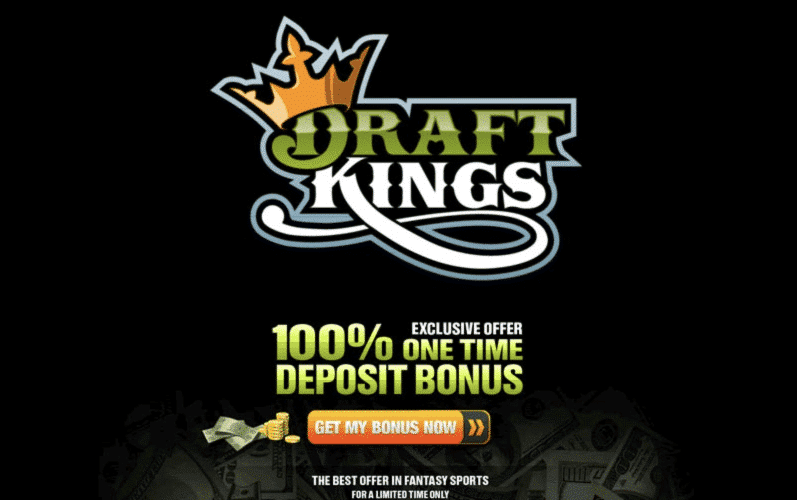 Starting out of Boston in 2012, DraftKings has grown massively since then with an expansion into the United Kingdom and a crusade to legalize Daily Fantasy Sports betting across the United States. 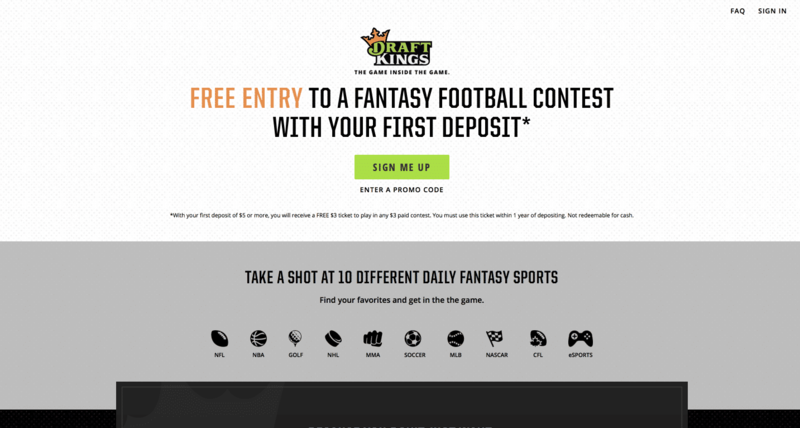 DraftKings has a well-designed website for permitting members to participate in even more fantasy sports competitions than in previous years, growing its total number of contests, handle, and payouts each year. 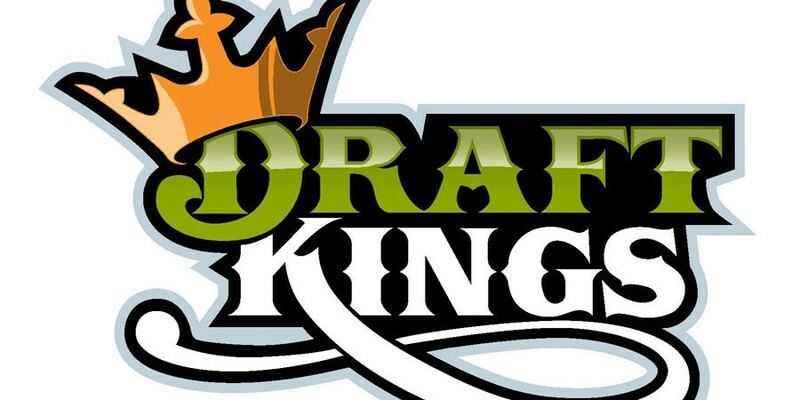 DraftKings is a top choice for playing legal daily fantasy sports, hosting over half of the industry’s players. With virtually every possible professional sport available, It provides a perfect platform for anyone who already plays or is interested in trying DFS. DraftKings has numerous game types with different odds and respective payouts, whether you are trying to win big in large tournaments or wager with friends and family. The site does a great job of making Daily Fantasy Sports fun and easy for casual players as well as organized and set up for professional players too. Our summary of our DraftKings review is that DraftKings is at the top of Daily Fantasy Sports, offering solid bonus promotions and a DFS contest for everyone. "Second biggest Fantasy Sports site out there with tons of great promotions. "